Ambien, America's favorite prescription sedative, takes between 15 and 30 minutes to kick in. Responsible Ambien users (as well as people who've learned from their mistakes) throw back a sleeping pill, shut their eyes and wait for chemically induced rest to claim them. But, when people don't fall asleep within 25-or-so minutes of popping an Ambi, things get weird. And that's when Ambien Walrus shows up. For those who don't frequent Ambien sub-reddits, Ambien Walrus (Genus: Nonsense Characters, Species: Drug-induced Animals) is the embodiment of the drug's side effects, which include losing inhibition, hallucinating and snacking on bizarre combinations of delicacies edible and inedible alike. Basically, the pre-Ambien you goes on hiatus and a creature who lacks social boundaries and any sense of sensory reality takes up residence in your body. "When [Ambien] works as intended, the user is like a lump, but when it exhibits its adverse effects, the user is driven to sleepwalk, shuffling around awkwardly as a walrus would flipper across an ice floe." Walrus likes to write vivid (and sometimes impressively lucid) emails to minor acquaintances. When Walrus is beyond the point of making sense, it fires off word-salad texts instead. (Walrus can't fight the urge to engage; it has legit FOMO.) If Walrus happens to share a bed with someone, it may get amorous with that person. It may unleash a string of unspeakably dirty and specific directives to that person. It may pass out, mid-coitus, licking that person's pinkie toe. Walrus doesn't play by the rules. You may not be much in the kitchen, but Walrus is a culinary innovator. It's basically Wylie Dufresne, if Wylie Dufresne had the impulse to whip up a meal of Chunky Monkey-swirled-hummus served with a pesto-and-peanut-butter remoulade. When you look at your bathroom floor, you see boring beige tiles. Walrus sees a sea of sandy waves. So why have Ambien fans (FAN-biens? Fan-biens.) come to classify this feral alter ego as a Walrus? Well, when you trip on the big A, you feel like you've got a plus-one, as one Quora commenter explained: "There is this looming "other" presence over your trip. A lot of the time you will even refer to yourself as "we" in writings...Ambien sends you on a journey into nonsense while feeling like you have a buddy right along there with you." But why Walrus, as opposed to, well, any other animal? For that, we reached out to Drew Fairweather, the cartoonist behind the webcomic Toothpaste for Dinner, who coined the term in 2007. In the comics, Ambien Walrus doles out terrible pieces of advice, such as "Call all your ex-girlfriends." Walrus likes to write vivid (and sometimes impressively lucid) emails to minor acquaintances. When the Walrus is beyond the point of making sense, it fires off word-salad texts instead. "The behavior of the walrus is a natural comparison for a user of Ambien," he told us. "When zolpidem (generic Ambien) works as intended, the user is like a lump, but when it exhibits its adverse effects, the user is driven to sleepwalk, shuffling around awkwardly as a walrus would flipper across an ice floe. It also drives the user to bouts of aggression which resemble that of the walrus in mating season." Fan-biens name-drop Ambien Walrus on Reddit all the time, but Fairweather said that no one else has asked him to explain the original meaning behind the term. Regardless, plenty of internet commenters offer their own explanations. Some are plausible. Others aren't. 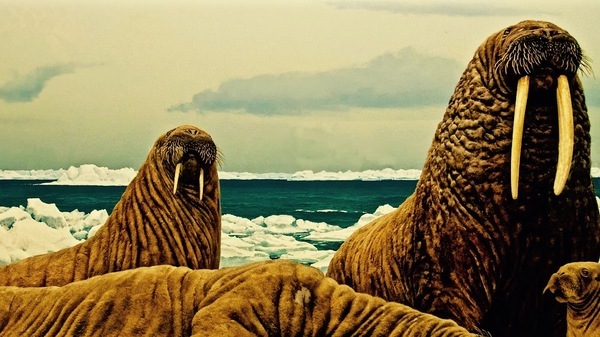 A few claim that Walrus is a reference to the 1967 Beatles song "I am the Walrus." To be clear, Ambien became available in 1993. Of course, plenty of other hallucinogenic drugs existed in the '60s. But, while memorable trips down LSD lane inspired other Beatles songs, that Walrus was actually a reference to a Lewis Carroll poem. "The influence of Ambien exerts itself so strangely that the user seems to be compelled by something external egging them on to perform bizarre actions," Fairweather added. "Thus, the Walrus."